Fox inks deal with Google to bring content digitally before retail. I remember the days when you'd desperately wait years before a movie was available at the VHS rental place. Here we are thirty years later, and blockbuster movies can be found in stores a scant few months after they were in theaters. That wait time is going to get even shorter, thanks to the digital revolution. Yesterday, Google announced a deal with one of the biggest movie studios in Hollywood, Twentieth Century Fox, to bring more than 600 movies and TV shows to its Google Play service and YouTube. Google hopes that Fox is just the first of the six major studios to come to terms with a digital marketplace. "We're happy to share that Family Guy and 600 other titles from Twentieth Century Fox will soon be joining the catalog for you to rent or buy on Google Play and YouTube," said Jonathan Zepp from Google. 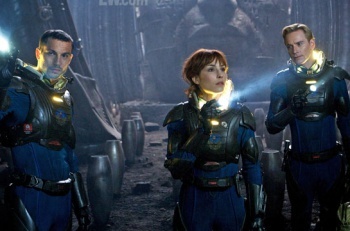 According to Variety, Prometheus will be the first film on Google Play and YouTube under Fox's new Digital HD program, three weeks before you can buy the Blu-ray or DVD. Heck, that's even before you'll be able to watch it "on-demand." "Over the next few weeks you'll be able to rent or buy your favorite Fox movies like X-Men, Ice Age and Black Swan, and TV shows like Glee, Modern Family, New Girl and many more," Zepp continued. "These new titles will be available first in the U.S., and we'll be bringing them to more countries soon. We're now working with all six of the major film studios and many independent studios to bring you the best new releases and your favorite classics to rent or own." I'm not sure how Google will charge for Prometheus on YouTube - or if we'll be able to watch it for free - but I think this is a fantastic development for the consumer. Sure, it all depends on the pricing on Google Play, but the more options we have for digital purchases the better.